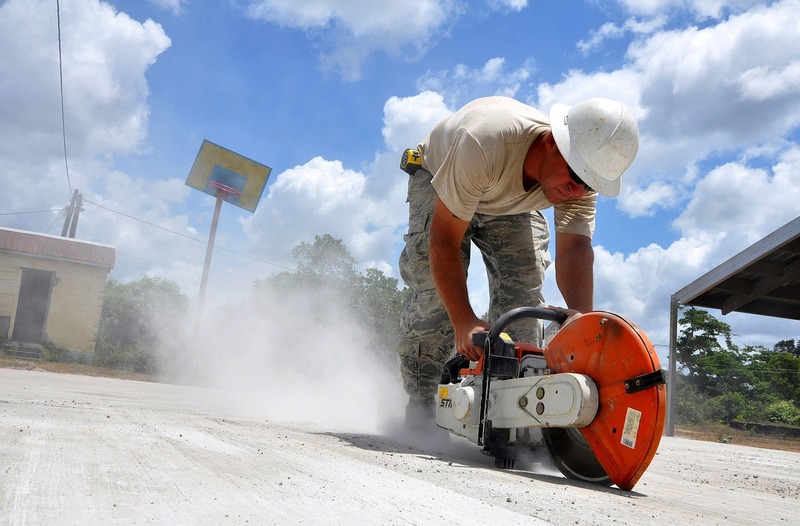 Concrete cutting is a project that could require an assortment of tools to complete. For small to medium sized projects, the most essential tool would be a good concrete handsaw. There are many different types hand sawing tools for cutting concrete. All of these require different levels of skills to operate each one. Without the proper tools, the outcome of your project may result in disappointment for you. Hence, you must be careful when selecting the best handsaws for the job. This article is an overview of the various types of hand sawing tools that you can use for your concrete cutting project. The origin of handsaws dates back several thousand of years ago. In fact, this type of tool can actually be seen in the hieroglyphs of the ancient Egyptians. The name that is given to these various types of saws has changed over time. They were also referred to as fish saws or panel saws, to name a few. A typical handsaw looks very much like a tenon saw, however, it has only one sharp flat edge. If you have worked in the concrete cutting industry for quite some time, you have seen an enormous number of handsaws that were often used prior to the age of modern machinery. They are used for cutting stones and slabs of concrete very quickly. These types of saws consist of a handle, the blade and the frame. In order to cut concrete with some degree of precision, you need to select the right type of handsaw. Prior to starting a project, it is important that you know which type of saw you are going to need to complete the project. There are many different types, but there are two specific designs from which all saws are made. The first type is called a rip saw and the other type is called a crosscut saw. It is highly recommended to have both types of saws when you are starting a project that requires sawing. It’s good to know the difference between the two. That way, you will know which one to use for each piece of concrete that you are going to cut. This allows you to choose the right saw for each cut that you make. A crosscut saw has a blade has teeth that are angled back, which are effective for cutting precast concrete hollow core slabs. It also has a bevelled edge. Compared to a rip saw, a crosscut saw has much smaller teeth. Its cutting edge is almost knifelike, allowing you to make very precise cuts through concrete. This is something that only smaller toothed saws will enable you to do. A benefit of using this particular type of saw is that it will cut as you push through and pull back when cutting concrete. This makes crosscut saw a much more efficient option. In contrast, the rip saw is designed to cut through concrete, marble and granite with ease. The teeth of the rip saw do not angle backwards and are not bevelled in any way. Instead, they actually alternate from left to right in a specific pattern. This enables each of the teeth to mimic a chisel, easily chipping away the slab of concrete you are cutting. But, this can only be done when you push into the concrete. Unlike the crosscut saw where you can cut both in a pushing and pulling manner. A rip saw allows you to have a much cleaner cut. This is something that you will want when cutting harder stones and concrete. It is less efficient, however, because when you pull back, it doesn’t cut at all. Now that you already know the difference between a crosscut saw and a rip saw, it’s time to look at the different types of saws. Each type of saw can be used for each specific type of job that you may have in the future. There are seven important things that you need to do before a concrete handsaw. If you don’t, you could inadvertently injure yourself. At the very least, you could make mistakes with your cuts that could cost you a significant amount of money. Therefore, you must take some safety precautions. Doing this ensures that you will have the best chance of completing your project without error. The first thing you need to do is make sure that the teeth on the saw are set evenly. If this is not secured, you could end up curving off to the left or right. This is true even if you are pulling and pushing it straight. Make sure that the blade itself is actually straight. The same thing can occur with even the slightest bend or bow. It can cause you to make mistakes. Next, check if the teeth are actually sharp. This can be done by simply rubbing your finger over the top of the blades. Be careful not to cut yourself. Just do it to make sure that the teeth snagged on to your skin. This clearly shows that they are sharpened as they should be. Once the blade is in place, make sure that the saw feels balanced and comfortable in your hand as you hold it. It should not be top-heavy, nor should it feel awkward to hold. This can affect your straight and true sawing motions that will help you make the perfect cut. Final checks include looking at the blade crown and the built-in tension on the saw with the blade. Make sure it should be somewhat flexible. If all of these vital aspects are checked already, you are now ready to start your project. With all the inspections having been made, you now have the confidence to make the best cuts every time a sawing job arises. Once you are ready to make your cuts after putting your cutline on the concrete, start first with your thumb or knuckle holding the concrete as a guide. This helps to make sure that your cut starts off straight. If you are using a crosscut saw, then begin your cut with their teeth that are nearest to the handle itself. The reason for doing this is because it will give you the most control. By making a few quick cuts to notch into the concrete, you will be ready to make the proper strokes. If it is a rip saw that you are using, doing the opposite is true. This is because you are going to use the finer teeth that are located furthest from the handle. Thus, enables you to perform short strokes back and forth. Once this is done, take a look at the angle of the saw. Make sure to keep it at 45° at all times, as you saw the concrete back and forth. For the most leverage, always keep your elbows as close to your body as possible. People have a tendency to angle the blade away from their body. Holding your elbow close to you will eliminate this problem. It will also give you plenty of power to cut through virtually any type of concrete without having to use too much effort. As long as you are holding the saw properly, with your forefinger extended and your strokes are deep and smooth, you will be able to slowly cut the stone or concrete you have marked. To cut concrete as accurately as possible, start by drawing a line while making sure that you are using some type of square or level. Doing this ensures that this guide will keep it perfectly straight, ensuring that your first few strokes are as straight as possible. If you already have an experience with sawing concrete, then you will probably not need to use this guide anymore. Once you have chosen the proper handsaw for the job and made the recommended safety checks, you are now ready to start your project. Whether you decide to use a crosscut saw or a rip saw for the job, it will depend upon the type of concrete you will have available. If you are not sure if you will be going against or with the grain, you should certainly consider getting both types of saws. This way, you will have several options to choose from. This allows you to make the straight, curved and very precise cuts that will be necessary to complete your concrete cutting project. Completing your project, whether large or small, requires you to have the proper tools. Selecting the right hand sawing tool is an important part of the process as well. Hopefully, this information can be helpful in selecting hand sawing tool that you will need for your up and coming concrete cutting project. Following some of the tips mentioned above will give you a final result that you will be very proud of. However, sometimes a hand sawing tool is not only intended for concrete cutting projects. There are times when you need to handsaw a portion of the concreted area in your property. This task may require a skilled professional with the right hand sawing power tools especially designed for concrete. For precise and unmatchable results, you may call on MegaSaw. We are Australia’s leading service provider for cutting and sawing concreted walls and floors. For more information visit us at 12 / 433-435 Hammond Rd. Dandenong South 3175 or call 1300 920 419.